In a high school classroom, students mourn the loss of one of their own: Tomie Kawakami, who has been murdered and dismembered. Shocked by the announcement of her death, the class is puzzled by the cruel fate that has befallen someone so dear to them; such a radiant and beautiful girl did not deserve such a hideous demise. However, a strikingly familiar student suddenly appears at the classroom's entrance. Gorgeous, slender, and with a beauty mark under her left eye, Tomie smiles and apologizes for being late. But this is just the beginning of the mysteries surrounding this seemingly inhuman woman. The men unlucky enough to catch her eye become smitten with her instantly, but also become driven by a dark impulse to dismember her, one they often succumb to. And each time, Tomie returns from the dead to continue her favorite pastime: toying with men. 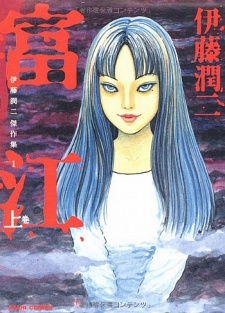 Tomie was published in English by ComicsOne on April 4, 2005. VIZ Media republished the series in a single hardcover omnibus on December 20, 2016. The story Painter was also published by VIZ Media as part of Shiver: Junji Ito Selected Stories. The series was also published in Polish by Japonica Polonica Fantastica in two-volume edition in February and in May 2015, respectively; and in Spanish by Ediciones La Cúpula, but discontinued after the second volume, and will be republished by ECC Comics in August 2016. Story - All I knew when I started this manga was that 'Tomie' was a woman who could make men fall madly in love with her at first sight. As you can imagine, I wasn't really expecting much and was very impressed by what I read. I loved every chapter and felt they were all very original and well thought out to how each 'Tomie' manipulated and charmed each character in the manga which eventually ends in her own demise. Art - As the other review has mentioned, the one strength to this anime is that Tomie is truely beautifully drawn in the manga with her beautiful eyes and shiny hair and there is a lot of attention to detail, especially when her beautiful form is distorted by the 'monster' beneath. Character - The smaller characters are simply prop to the many 'Tomies' that prop up in all the stories. It is especially unkind to the men who fall madly for Tomie in each arc. Not much is known about Tomie except for her supernatural abilities and as you get more and more used to her character, the stories seem to get more complicated and baffling. Great! And a real challenge for the mind! Enjoyment - I throughly enoyed 'Tomie' and despite it not being as 'terrifying' as I thought it could be, I found it was a very interesting concept about a strange multiplying girl with no purpose but to make people love her as much as she loves herself. Overall - Definitely an interesting manga if you like different story arcs and strange characters and plotlines. It can be a little gory/strange in places but hey - what can you do?! I had read Junji Itou's 'Uzumaki' around two years ago and was impressed by his creativity at horror storytelling because it actually made me freak out (which rarely happens to me while reading horror manga). And that was one reason why I picked up 'Tomie' nearly two years later. The other reason was, well, I wanted to pass my time. When I read the plot, I was excited and expected it to be as scary and thrilling as 'Uzumaki' was, or if possible, more than that. However, it turned out to be a bit of disappoint for me by the time I reached the 6th chapter. Why? Because, there is basically one common plot for every chapter with different settings and different set of characters. The story basically goes like this: There is a pretty, attractive girl named Tomie who can make almost every man fall for her, and then due to some absolutely out-of-the-blue circumstance, she is beheaded or cut into pieces (how scary and ridiculous does that sound? ), and then she regenerates herself in an utterly pathetic manner to spread havoc and shed gallons of blood! Each chapter portrays Tomie as the antagonist who never dies. None of the chapters mentions or gives at least a subtle hint about her past or why she is like that. Is she a witch? A monster? Or perhaps an alien with the power of regeneration?! No one really knows. The mangaka uses this as a frame for each chapter. When I began to read the manga, I honestly enjoyed reading the first few chapters but gradually it became boring and I lost interest, mainly due to the use of the same plot again and again for every chapter. The art is quite good because it has realistic human figures unlike the mainstream manga art styles with the characters having large eyes and abnormally long limbs! It is perfect for portraying horror and gore. The characters are nothing special. They are not likable but not unlikable either. This is mainly due to the fact that every chapter has different characters who play their roles and when the particular chapter is over, their roles are over as well. This way we don't get to know the characters properly. Tomie is of course an exception as she is the primary character but I feel that the mangaka's purpose to create her character is only to scare the readers. You hardly get to know anything else about her. To conclude my review, I'd say that you may pick this one if you're looking for something scary and freaky to read but most probably you'll end up losing interest in it after reading the first few chapters like it happened in my case. Tomie is one of my favorite manga, so ill try not to be as biased. Now before you start reading Tomie, beware that its intended for adults only since it depicts extremely graphic scenes. There isnt really a main Story, there are some minor and major arcs, there is one character, Tomie, that always reappears in each of the different stories though. Each story has something that makes it interesting in its own with different kinds of side-characters being impacted differently by the main character. It's hard trying to explain the story without spoiling so if this review wakes your interest you should definitely check it out. The art-style is pretty unusual from what you normally see, personally I actually quite like the more depressing, realistic approach from Junji Ito. Considering the age of the manga it's quite impressing. It might be a bit off-putting for those who have only read the more usual stuff but you should definitely give the arstyle a chance. As i said before there is one reoccuring character throughout the story and that is Tomie. So ill warn you now there might be some spoilers ahead! Tomie isnt quite like other main character, throughout the story her actions and personality is similar, but the character is never actually the same person, she lives on forever basically. She also has the special ability to seduce any man she wants and make said man do a certain thing. Again if you want to know more definitely read the manga. I would consider Tomie to be an interesting mange to read when you are waiting for another mange chapter to be released. It it definitely good to pass the time but it isn't anything to write home about. STORY: The story is very simple. There is a succubus (Tomie) that has immense beauty and charm. She goes around seducing men and driving them to murder and driving women to insanity. The victim of the aggravated violence is usually Tomie herself. When she gets murdered she spawns more of herself and regenerates, continuing her curse. It is even alluded to towards the end of the manga that "Tomie" has been on Earth long before the time represented in the manga. Every chapter is episodic leading to a different group of people being effected every chapter. The first couple of chapters were really interesting but after maybe chapter 9, things started to get really repetitive. ART: This is Junji Ito's first manga so in the beginning the art wasn't that great but as it progressed there was a huge improvement in style and it looks more like what everyone else is familiar with if you have read his other works. At moments Tomie was drawn very beautifully and a lot of the gore scenes were really well drawn out and they were very powerful moments but again the manga itself isnt totally outstanding. CHARACTERS: as far as art goes, some where unique enough to temporarily remember. most of the high school boys look practically identical. because the story is episodic, the characters in each chapter switch so there really is no importance in knowing who they are anyways except for obviously Tomie and her teacher Mr. Tagaki as he often comes back to forward the plot. ENJOYMENT: There were some chapters that were genuinely interesting and i was very invested in the plot, other chapters barely had me engaged because of the very flat story arc. It will tend to get flat towards the end because you can predict how to chapters are going to play out.